A main goal of the Affordable Care Act is to provide Americans with access to affordable coverage in the individual market, achieved in part by promoting competition among insurers on premium price and value. One primary mechanism for meeting that goal is the establishment of new individual health insurance marketplaces where consumers can shop for, compare, and purchase plans, with subsidies if they are eligible. 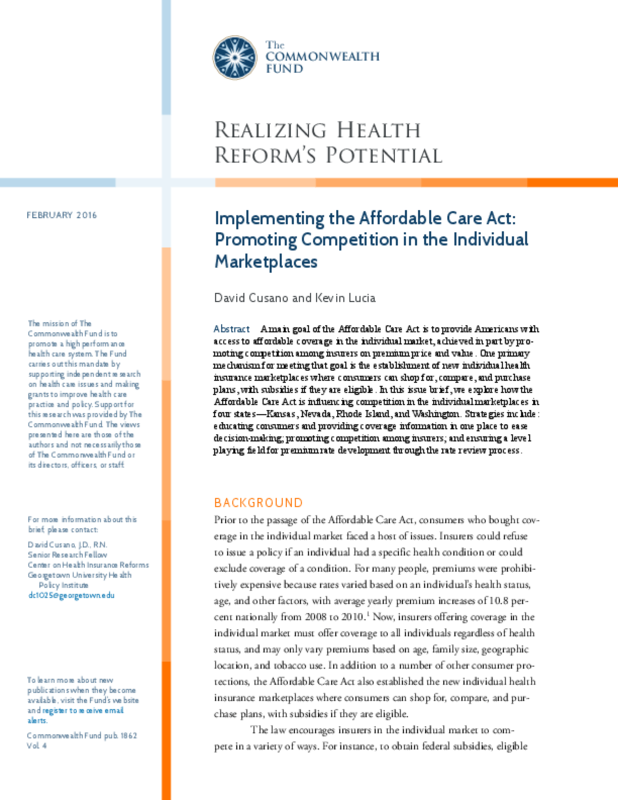 In this issue brief, we explore how the Affordable Care Act is influencing competition in the individual marketplaces in four states—Kansas, Nevada, Rhode Island, and Washington. Strategies include: educating consumers and providing coverage information in one place to ease decision-making; promoting competition among insurers; and ensuring a level playing field for premium rate development through the rate review process.